Pick your favorite cruise and find a departure that fits your needs! For more information click on the departure time of your choise. You can buy your ticket at the departuring ship from our ticket dealer. There is an on board bar and toilet on our ships. For your comfort please arrive latest 15 minutes before departure time. On the 60 minute boat trip you will get known a brand new face of Balatonfüred. Cruising along the coastline we will see the sights of Balatonfüred: Tagore walkway, passenger port, sailing ship ports, hotels, caping, water-ski. After that we set the cruise to the beautiful Tihany peninsula with the stunning view of the Benedictine abbey, and the famous Echo hill. After reaching the port of Tihany we turn back to Balatonfüred direction and look back to our starting point from a few kilometer perspective. During the cruise a guided tour can be heard, we will keep you informed about the attractions. The data in the timetable is just for informational purposes. Cruises start in case of a minimum number of participants. 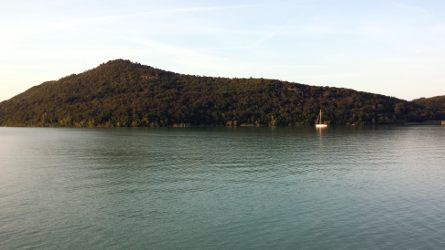 This time we invite you to a longer ride: after reaching the end of the 1 hour cruise we are not turning back but set sails to the west side of the Tihany peninsula. We pass the narrowest point of the lake between Tihany-rév and Szántód rév, check the ferry boats, have a closer look at the south coast and the west part of the lake which was covered by Tihany until now. If the weather is clear enough, you can catch a view of the typical hill of Badacsony as well. We can admire much closer the Tihany Landscape Protection Area which has an extremely rich flora and fauna, because we only sail about 100 meters from the shore. We say goodbye to the western side after approaching the Gulf Bozsai. During the trip you will hear and learn a lot of interesting informations and you will be invited even for a glass of wine, too. Currently there is no scheduled route. Please call or write us to help you. 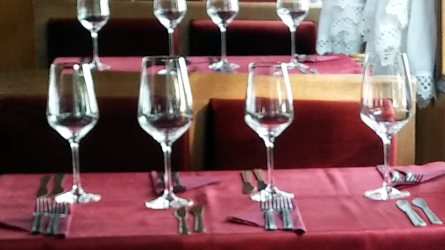 During this one hour long trip, besides you can watch the beauty of Balatonfüred and Tihany, we offer you an excellent wine tasting onboard. 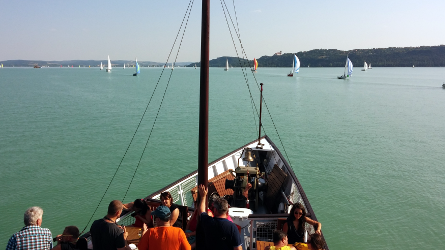 A ship-tour to Badacsony with Grill-party and wine tasting on board. 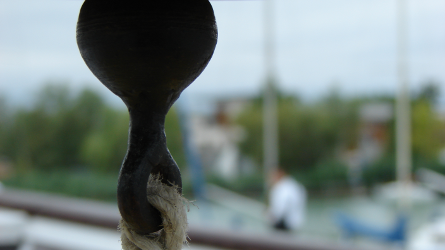 Spend a nice day with us on Lake Balaton! 09:00 Departure from Balatonfüred to Tihany by ship. On board the captain of the ship welcomes the guests and greets them with a glass of champagne. 13:00 Wine-tasting in Badacsony: four different types of wines and snack is offered by the cellar master.